Bashful Blue and Chocolate Chip reminds me of Pottery Barn for some reason (LOL). So I kept this card clean and crisp but I really like the way it came out. This is another card we'll be making at my Holiday Card Making class (Nov. 6th) and will be part of the Class Kit as well if you cannot make the class (or the rescheduled date). It was quite easy to make. 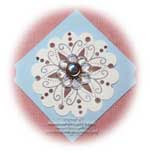 Simply color in the medium sized snowflake from the Snow Swirled stampset first with Bashful Blue. Then use the Chocolate Chip marker on the tips and desired parts of the snowflake. Then stamp on the Whisper White paper. Do this twice. 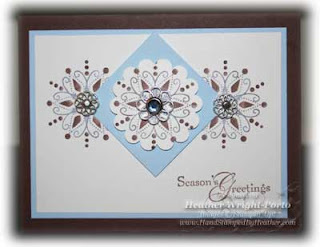 Then for the center snowflake, stamp on scrap paper and punch with the Circle Scallop Punch. Use Piercing tool to pierce all snowflakes. 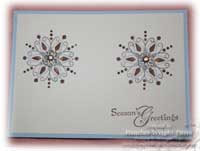 Since the center snowflake is the focal point, this has the larger Filigree Brad and the blue rhinestone. The other two snowflakes on the card have smaller Filigree Brads and the silver brads that come with the Filigree Brads container. 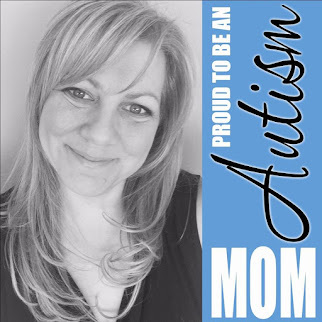 Add the focal point snowflake, to the 2x2 inch square piece of Bashful Blue paper (where 2 sides have been punched) using SNAIL adhesive. Then this focal point is finally adhered to card front using Stampin' Dimensionals (where the rest of the card is assembled using SNAIL adhesive). Simple elegance Heather. Lovely card! This stamp has always seemed to take backstage from this set with me as 9 out of 10 times I've reached for the lovely tree instead. You've inspired me, thank you. Heather, this is sooooo beautiful! I love the simplicity of it!